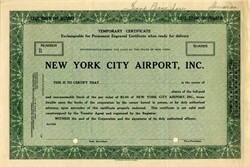 Beautifully engraved Specimen certificate from the New York City Airport,Inc.. This historic document was printed by E.A. Wright Bank Note Co. in the 1920's and has an ornate border around it. This is the first time we have seen a certificate from this early New York Airport for sale. The New York Airport Company was dissolved in 1931.